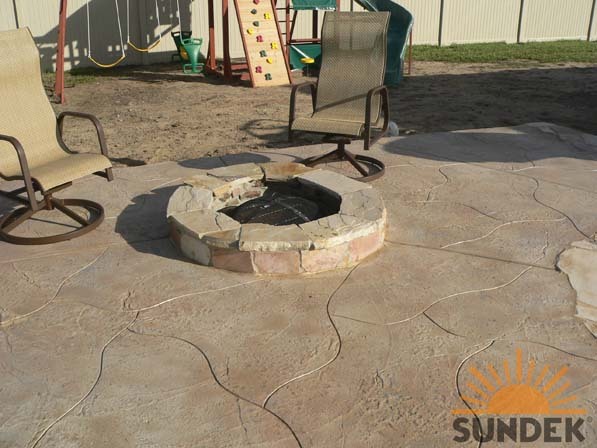 A stamped concrete overlay provides a great option if you want to dress up a surface. Concrete stamping is a process that yields a similar result but that is done in a different way. A concrete overlay is applied to existing concrete. Concrete stamping is done when the concrete is first poured and is a process that actually involves creating imprinted concrete by stamping it while it’s wet. A stamped concrete overlay can be applied to any existing surface. A stamped concrete overlay can provide you with a surface that mimics other, less durable surfaces. People oftentimes use this custom concrete work to get the effect of certain types of tiles, stone textures, paving stones and other surfacing options with the advantages of concrete. The concrete overlay can give you a look that is almost exactly like any of these other surfaces but that is every bit as durable and long-lasting as any other type of concrete. Imprinted concrete is a popular option around pools and outdoor recreation areas, in garages and basements. Having a concrete overlay used in these areas can provide practical and aesthetic benefits. Some textured concrete overlay options provide good traction, which is useful in areas where people may be barefoot or where water may be present. The aesthetic benefits include being able to use the concrete overlay as a way to imitate a wide variety of surfaces. Stamped concrete overlay work can dress up an area and make it look like something entirely new. If you’re interested in having custom concrete work done in the Bay Area or in Sacramento, be certain to contact Sierra Concrete Resurfacing. Whether you need an old surface dressed up or an entirely new surface put down, we can provide you with the expertise and the experience with custom concrete that will get you the results that you want.